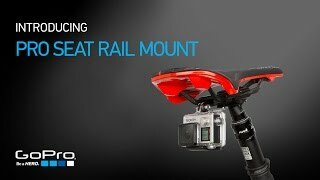 The GoPro Pro Seat Rail Mount is a compact aluminium mount designed for serious cyclists and bikers. The saddle rail mount provides a low profile, rear facing camera position that allows you to capture some of the most action packed footage about. With the standard GoPro fitting you are able to fit all GoPro's from the first to the current Hero4 model.